Burl Barer, his daughter, Anea Barer and Don Woldman discuss her experience with Serial Killers! Anea Barer met the Green River Killer and lived to talk about it, went to school with the daughter of the Spokane Serial Killer, and did a job interview over the phone while the interviewer was holding a young boy captive, chained to his bed! Yes, Anea knows true crime, radio and much more. 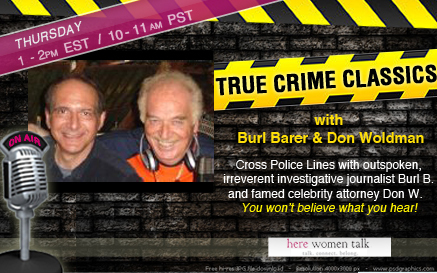 This TRUE CRIME CLASSIC broadcast from 2008 was the second show Burl Barer and Don Woldman had ever done together. Joining them is also Judi Faye who was dating Burl at that time.